If you love fried food and often need to whip up batches for large families or parties, the Flexzion Deep Fryer Dual Tank has you covered. With double stainless-steel baskets and a capacity of 12 liters (or 12.7 quarts), it’s the best deep fryer for making large quantities of fried food. This dual-tank fryer uses 5000-watts of power for both tanks, or 2500-watts for just one. Each cooking side functions separately and has its own fry basket, its own power plug, and its own analog control panel to set the temperature. The Cuisinart Compact CDF-100 has a three-year limited warranty; which is the best warranty on a deep fryer we came across. It’s even better than the warranties on most Cuisinart products, which is only a one-year limited warranty! That’s not all this deep fryer has going for it: it’s compact, easy to use, and makes delicious food. French fries. Fried chicken. Fried fish. Fried mozzarella sticks. Funnel cakes… Is there anything more delicious or crave-worthy than fried food? No, it’s not healthy, and we won’t pretend that it is. And yes, it has been linked to increased blood pressure, obesity, and other health problems. But we’re not here to talk about health, we’re here to talk about cooking. And one fact remains: fried food is pretty damn good. In the 1990s, electronics company Philips launched a new type of fryer: air fryers. Unlike deep fryers, which use hot oil to cook food, air fryers need just a light dusting of oil and use high-heat to cook food. The result is a product that has up to 75% fewer calories, but critics say it can also have up to 75% less taste. Check out air fryer vs deep fryer: what’s the difference to see how the two appliances stack up. If you do suffer from high blood pressure or need to cut calories, we suggest you check out air fryers. However, if taste is your number one priority when cooking, we recommend looking at deep fryers. Here are a few of our favorite deep fryers on the market and our top picks for 2019. 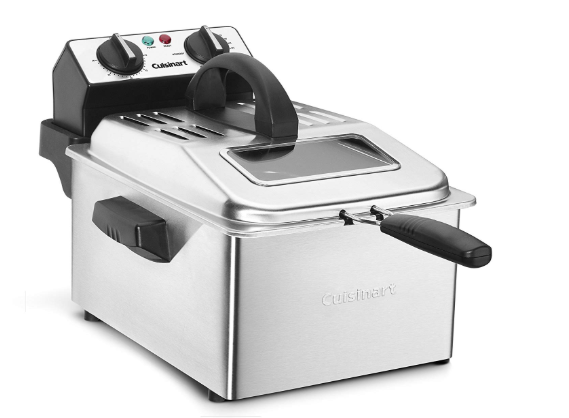 If you’re a frequent fryer, our top choice of deep fryers is the Cuisinart CDF-200 Deep Fryer. 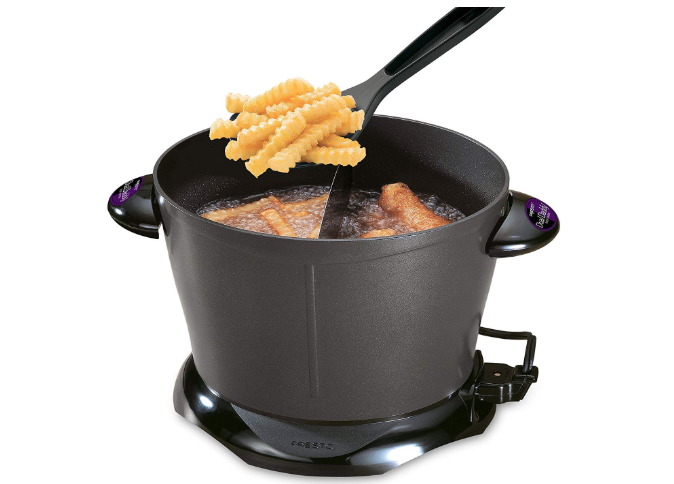 Using 1,700 watts of power, it’s easy to use and produces deliciously golden fried food. It has an easy to understand temperature control dial with a minimum temperature of 175 degrees Fahrenheit and a max of 375 degrees Fahrenheit. It also has a 30-minute timer so you don’t have to stand over the fryer and watch until your food becomes the perfect shade of golden brown. In terms of capacity, this deep fryer features a large frying basket that can fry up enough to feed a small family. 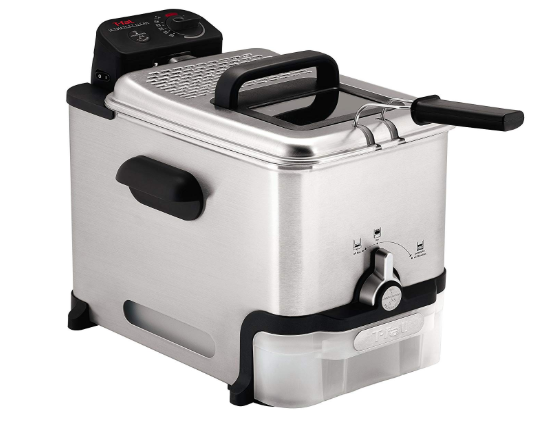 If you’re looking for an affordable deep fryer and don’t care about temperature settings, timers, or special cleaning features, then you can’t go wrong with the Presto DualDaddy Deep Fryer. For the price, it’s a great deep fryer. If you don’t need to fry a lot of food, why purchase a fryer with a large capacity? Instead, consider investing in one that’s small enough to remain on your kitchen counter. Our top pick for best small sized deep fryer is the T-Fal FR8000. T-Fal, a trusted appliance brand, offers single and triple basket deep fryers. We love the single as it cooks the perfect amount of fried food for a couple. It can hold 2.6 lbs of food and has a 3.5 liter oil capacity. It also features an adjustable thermostat and an immersed heating system for quick cooking. Plus? It’s easy to clean! If you’re looking for a large, electric deep fryer, check out the Flexzion Deep Fryer Dual Tank. With double stainless-steel baskets and a capacity of 12 liters (or 12.7 quarts), it’s the best deep fryer for large families or those that like to entertain. This dual tank fryer uses 5000-watts of power for both tanks, or 2500-watts for just one. Each cooking side functions separately and has its own fry basket, its own power plug, and its own analog control panel to set the temperature. This is a large deep fryer and measures 22-3/4″ x 17-1/4″ x 12″. You’ll need adequate counter space if you want to use this deep fryer. The temperature control range between 248 and 392 degrees Farenheight. It features advanced safety features such as a temperature limiter and microswitch protection. 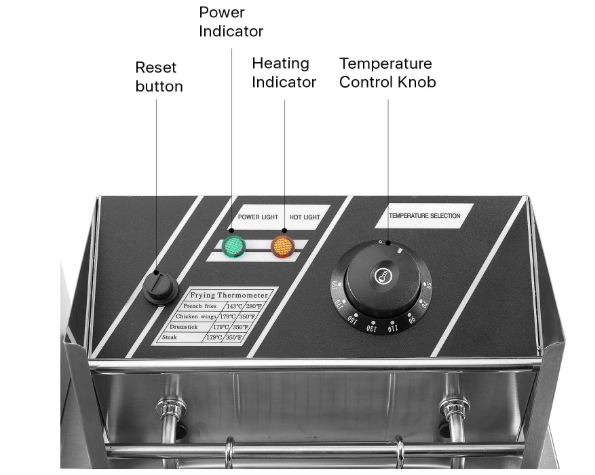 The temperature limiter turns on when the temperature becomes too hot, and the microswitch protection turns the fryer off if it experiences a sudden impact. Fryer also uses a high wattage. You cannot use a converter with this deep fryer. Yes, we have Cuisinart on our list twice. Why? They make some pretty good deep fryers. 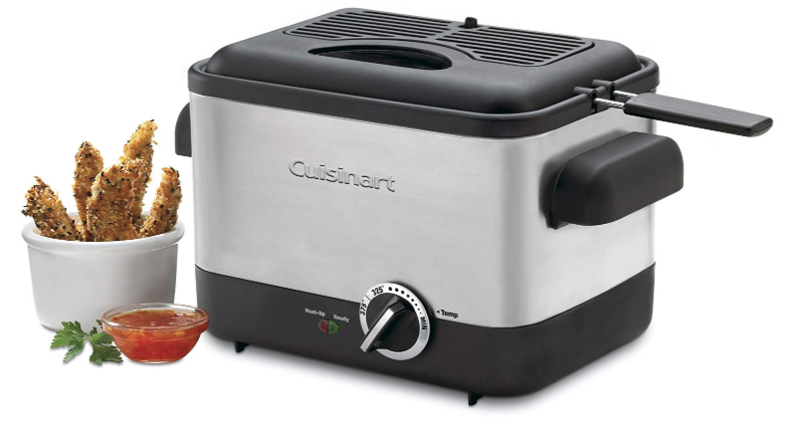 We ranked the Cuisinart Compact CDF-200 as our top choice deep fryer for the aforementioned reasons. And when it came down to looking at warranties, we realized that a Cuisinart deep fryer once again made our list. Why? It has the best warranty we’ve come across: a three-year limited warranty. And aside from the warranty, it’s a pretty great deep fryer. It’s small, so perfect for a couple. It’s affordable, easy to use, and is easy to clean as well. If you want to fry food, you’ll need a lot of oil and somewhere to put that oil. Technically you could fill a large saute pan with oil and place it atop your stove and whip up a batch of french fries, but it’s messy and dangerous (especially if you have a gas burner). As such, an electric deep fryer is better. Electric deep fryers are small enough to live part-time or full-time on countertops. They are typically made of stainless steel and feature a large interior section for oil as well as a fry basket (or multiple fry baskets). Functions vary depending on which model you select, but the more advanced ones have temperature controls, adjustable timers, and removable and dishwasher safe parts. 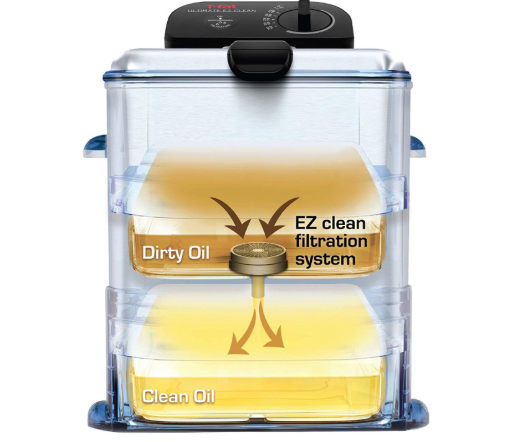 Some models come with oil filtration systems that filter excess oil into a separate container and absorb the oil and grease odors. Have you ever tried a deep fried turkey? If you live in the south chances are you have, as fried birds as a southern tradition. If not, we suggest you try one as frying a turkey can produce the juiciest, tastiest Thanksgiving bird you’ve ever had. Plus, it will cook it must faster than traditional oven methods will. Overall, we prefer electric deep fryers to turkey fryers. If you are looking to invest in a deep fryer that can be used for common fried foods such as fried fish, fried chicken, and french fries, you’re better off with an electric deep fryer. They’re easier to use, pose less risk, require less oil, and are smaller to store. 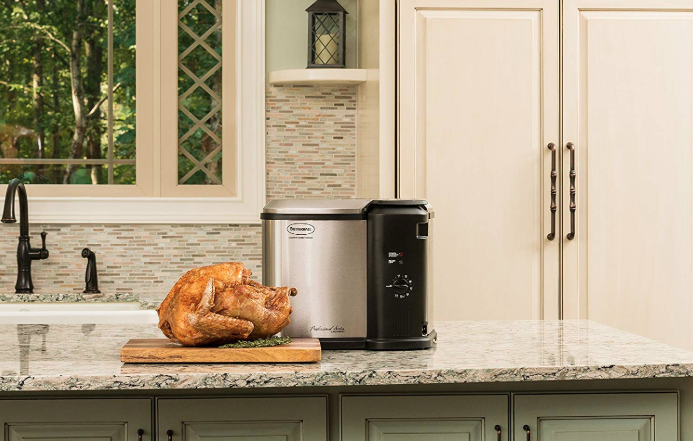 If, on the other hand, your sole purpose when investing in a deep fryer is to cook your family’s Thanksgiving turkey (and perhaps fry up a few whole chickens throughout the year or a few more turkeys), then go ahead and get the turkey deep fryer. So now that we’ve taught you the difference between an electric deep fryer and a turkey deep fryer, you should have an idea of what the best deep fryer for you is. That’s the first step in your buying journey. Next, you’ll want to look at factors such as capacity (both for the cooking basket and cooking oil), ease of use, temperature control, timer, and oil filtration system. You’ll also want to look at the safety features, ease of cleaning, price, and warranty. Deep fryers come in multiple sizes; smaller versions tend to hold one basket and cater towards couples or small families. A deep fryer with a 3-liter capacity or less is perfect for small families and tends to be 1000 or 1500 watts of power. Larger deep fryers can hold multiple baskets and feed entire parties. These deep fryers tend to start at 1700 watts of power and go up from there. Make sure you always look at basket sizes, however, and don’t rely on wattage alone and some high-watt deep fryers have small baskets and some low-watt fryers can have large fry baskets. Deep fryers have varying capacities for oil. For example, we looked at some smaller fryers that had a four cup maximum capacity while others could hold up to 16 cups. If you want to fry in small batches, you won’t want to use a large amount of oil so a lower oil capacity should be fine. If on the other hand you do want to cook large batches, consider a deep fryer with a large cooking oil capacity. In addition to a deep fryer’s oil capacity, you’ll also want to look at oil filters. Deep frying foods isn’t always a pleasant experience. There’s a lot of oil and grease, and not only can it make a mess of your kitchen, but it can also leave lingering odors. This is where a good oil filter can come in handy. Oil filters can help filter excess oil into separate containers within the bottom of the fryer, helping to absorb the odors of grease and oil. 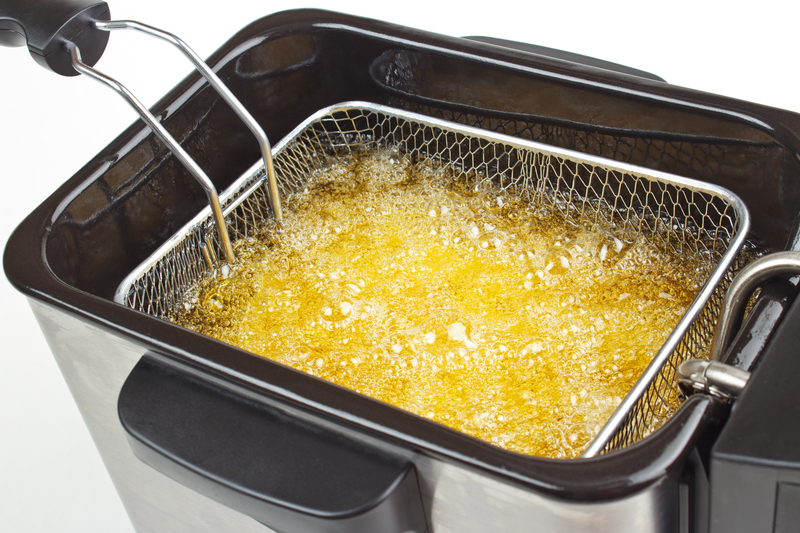 If you love the taste of fried food but hate the smell, consider investing in a deep fryer with a good oil filter. You’ll also want to look at how the fryers drain leftover oil, as disposing of it can be a hassle. Some deep fryers offer easy cleaning oil drain systems; this system consists of a hose connected to the front of the unit that allows oil to easily drain out the front rather than you have to pour it out from the top. It’s a much cleaner way of disposing of oil. Cleaning is also a major consideration when looking at deep fryers. Oil is a massive pain to clean up, and given the amount of oil used in deep fryers, many people fear deep fryers will be a horror show to scrub clean. Thankfully, this isn’t always the case. In addition to easy cleaning oil drain systems, most deep fryers have removable parts such as fry baskets and oil pans that are dishwasher safe. While teh housing units are not able to be thrown in the dishwasher, they can typically be washed with warm, soapy water and then rinsed and dried. You need a deep fryer that’s easy to clean. But you’ll also want one that’s easy to use! Some deep fryers have adjustable temperature settings and others don’t. Which is the best deep fryer for you? It just depends on your preferences. Some deep fryers have digital displays and others are analog. Again, pick the one that’s easiest for you to use. Do you plan on frying frequently, or making complicated items? If so, you may want a deep fryer with a lot of bells and whistles. If not, however, we recommend getting the simplest deep fryer possible as it will likely be the easiest to use. If you’re looking for a very basic (and low cost) deep fryer, it may not come with an adjustable thermostat that you can control. However, most do. Most of the deep fryers we looked at enable you to adjust the temperature of the oil; some even have an automatic function that monitors temperature and adjusts accordingly so it doesn’t get too hot or too cool. You may think that “fried food is fried food,” but the truth is different types of food fry differently and at different temperatures. Most good deep fryers will have a max temperature of 375 degrees Fahrenheit. Adjustable thermostats and timers seem to go hand in hand in quality deep fryers. If you have a timer, you won’t necessarily have to stand over your fryer waiting for your food to become the perfect shade of golden brown. Rather, you can sit back and allow the timer to monitor the progress and then alert you when your food is ready. Timers will help ensure your food is not overcooked or undercooked. Do you love McDonald’s french fries, Chick-fil-a’s chicken nuggets, and the deep fried Oreos you get at your county fair? If so, you know this fast food habit of your can add up! 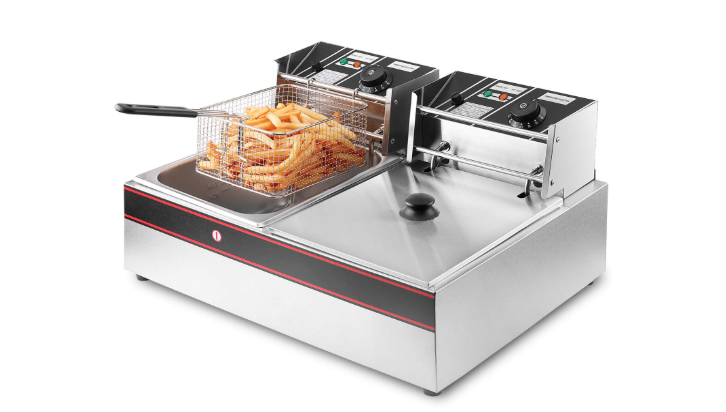 Deep fryers are a way of getting your favorite fast food items at a more affordable price. Deep fryers really aren’t that expensive – even the top models. Depending on your needs and budget, you can find a quality deep fryer for under $75. While the more affordable models tend to have fewer options and features, if cost is your main priority, you can still find a great deep fryer for an affordable price. Some products have lifetime warranties. We love these products and wish all appliances in our lives were guaranteed to last forever, but unfortunately, that’s not the case. Deep fryer warranties are all over the place. The most limited offer just three months. The majority seem to offer a limited one-year warranty. Some offer limited two-year warranties, and the best we came across offer three-year warranties.